From Blob to Enduring Love of Velo: And the prize for defending the world from roaming hordes of the undead is – a lovely handcrafted ninja throwing star! And the prize for defending the world from roaming hordes of the undead is – a lovely handcrafted ninja throwing star! Saturday was the Giant 12hr Day Nighter at McLeans Island and our team was there to protect all from any wandering zombies. We were the Swine Flu Survivers Zombie Killing Mtb Army on SingleSpeeds (SFSZKMASS), and we were thoroughly prepared. Our team consisted of Rita “Double Agent” Langley, a specialist in zombie mob infiltration and endurance missions. Anna “Skull Crusher” Ross, lethal with a baseball bat and a danger to herself and others. Mops “Medic! !” Newall, the Florence Nightengale of the group, tough as nails and with a mouth to match, but always willing to go to the aid of a fallen comrade. Ring-in Nicole “Sniper” Symons, fast as lightening and crack shot, called in at the last minute to replace Michelle “Kill them all!” Peterson, who was taken down by zombie scum with a nasty bite to the hip. We can only pray she’s not infected. 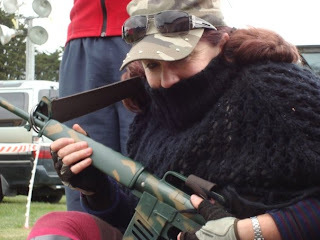 And finally me, Melanie “Field Commander” Dunlop, with the boots to kick the team in the arse and a voice to lay waste to all comers. The day started off in freezing style, hail pelted me as I packed the last vital supplies into the car. Anna arrived on time, a good omen for the rest of the day and we were off. Together we managed to secure a primo corner site with great lines of sight that would prevent us being flanked by the undead. In no time our camp was set up and coffee was brewing on the brazier, we were prepared for all eventualities. Rita bravely volunteered to lead us out and take the first two laps and soon she was lost in a sea of riders racing across the paddock to try and squash through the 2 rider wide scaffolding underpass. Rita set a blistering pace from the word go and we kept the camp clear of the undead scum and encouraged our fellow contestants on with kind words and soft voices. As Rita and Mops rode the first 4 laps I decided that the 32:15 I had on was a wee bit tall for my feeble legs with the wet energy sapping grass and the nasty head winds up the stop banks and through the exposed section. A quick change back to 32:16 and I was feeling much happier by the time it was time for me to ride. It was still freezing so I decided to try riding one lap in my knee high Doc’s. They were ok on the flat and through the swoopy bits, but rubbish climbing the stopbanks and extremely slippery any time they got wet in the enormous puddles that were dotted around the course. Still it was fun riding in inappropriate footwear and all the boys that passed me liked them! I turned in a pretty good first lap which I think was about 32 minutes, but I’m not really sure. We checked our times and discovered there was a bit of a stuff up with our transponder (ours was missing when I went to get it, so we had number 21 instead of number 535), but that was quickly sorted, and we found ourselves placed 2nd. There was much rejoicing at camp with this news. Only an undead freak could ride one of these! We continued battling the zombie masses at camp, liberally peppering our competitors with potato pellets (zombie brains), encouragement and insults. Not to mention chasing any lurkers with guns blazing and baseball bat at the ready. Mops also went to the rescue of a fallen 6 hr solo competitor who was suffering from cramp and used her healing powers to get him back on the bike. For some reason we couldn’t get many people to oblige us and “DO A SKID!!! !”, but the few we did get were impressive and led to great raucous cheers. Rita, Mops, and Nic put in the hard yards and did double laps, being strongly motivated with threats of beatings. Anna and I took turn about to do single laps and the sun put in a very welcome appearance. There was still some wind, but it was no where near as awful as the morning. My laps felt better and better as the day progressed and I was loving the course, especially the flowing new section through the trees. The exposed new section was not as much fun, with its strange bump placements and constant headwind. I even managed to pass quite a few people this year and the standard of passing was much better than last year with everyone being pretty considerate on my laps. The course was a good balance of hurty struggling parts and super fun bits where I was pretty much spinning out with the tailwind. It turns out all the roadie riding I’ve been doing has really paid off because my lungs were up to the task of the spinney gear. My throat was feeling worse for wear from the extreme heckling, so I rested it for short stretches when I wasn’t riding to make sure I could go the distance. Zombies can sneak up from behind, however are easily fooled by this ruse! We were lucky to be visited in our camp by plenty of cool people who came for a chat, to steal some of our warmth, to bring us delicious chocolate cup cakes (thanks so much Rachel, they were divine), and add to the lunacy we were trying to spread (yay! Michelle). 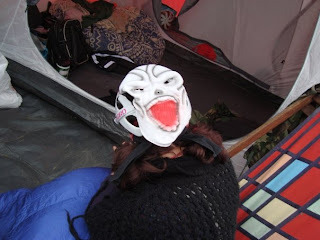 There was also a very exciting moment when the evil zombies released a double ezi-up into the wind and it came rolling over the camp site towards us. Lucky a shiny new Range Rover stopped it from impaling us all, but it was touch and go. 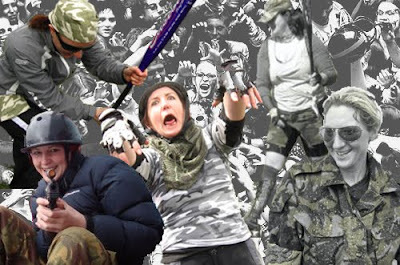 We never found the nest of zombies that threatened to lay us low, but we renewed our hunting with great vigour, smashing zombie brains with our bat whenever the opportunity arose. As the sun set we cranked up the fire again and sorted out the final lap order. As other teams stood round with clip boards carefully tracking each time, we cheered for the brave souls battling in the 12 hour solo. 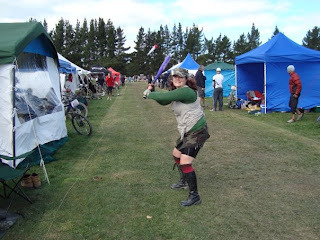 As other teams warmed up on wind trainers, we chased people with guns and bats and motivated them to try harder. And as darkness fell we got a wee bit serious and decided to go hell for leather at the end. I have to say I was feeling pretty nervous about doing the penultimate lap, however I was also relishing the chance to get a night lap in. As I set off there was next to no wind, but my legs were hurting bad. I kept pushing as hard as I could and by the time I got into the singletrack I was feeling good. I was in the hurt box in a way I’ve never been in before, but it was actually good and I was flying through the night. The whole last lap was a blur of passing, pain, grinning, grinding and joy. I truly loved this lap, it stands out in my mind as the best piece of riding I’ve ever done. I felt really fast and when I rolled into the camp I was completely and utterly spent and could only dimly comprehend how stoked my team mates were with my ride. I was grinning madly, but also struggling to stand and collapsed happy into the enormous pillow I’d brought with me for just such an occasion. I felt like I’d finally done a sub-30 minute lap, but the results say I only shaved 30 seconds off my time. Nic put in a scorching last lap and we hoped we’d held onto second. With military precision, of course, we disposed of the zombie corpses littering the camp and packed it away and headed to the prize giving. Fully armed, we formed a protective circle with Mops standing sentry and waited for the results. Finally the women’s category was announced and our name was called. We got third and were all completely stoked (even though 2nd was a mere 10 secs faster). We went out there to have fun and ride our singlespeeds hard, not to win anything. I’m pretty sure that we had the most fun of any team that day and we certainly showed that you don’t need to take team’s events seriously to do well. We all received our ninja throwing stars and also managed to snake the best dressed prize, despite the crowd’s lack of appreciation for our zombie fighting skills. It was a great event, well run and more fun than just about anything else I can think of. Thanks to my fabulous team mates for getting us onto the podium, my first ever, and those who came along to say hi and support us for making it such a brilliant day. And huge thanks to my hubby for putting up with me this weekend! Glad I came across your blog while surfing instead of working today, you lot made me smile each time I came past on my 6hr. I was chatting on a lap to ?Mops? (riding Oli's bike) early on and she also cheered me on of the race when I was less chatty! Sorry I didn't come and say hi after I'd finished, I was stuffed and in need of junk food! God...that actually looks like fun!!! (and I hate cycling!!!). Anyway, You have won a blog award. See my blog for more information. Yay for you!! !